From "What if?" to "Even if"
Have you ever been in a conversation with a friend and started out talking about one thing and before you knew it, you were on a completely unrelated topic? You both paused and asked each other, "What were we even talking about?" It's easy in a conversation to follow trails that take us far from where we started. This is true in our thought life as well. One thought leads to another and then to another, just like the rabbit trails our conversations take. While such trails are often amusing in our conversations with friends, in our thought life, it's not always funny. Sometimes, our thoughts take us down dark trails that lead us far from the truth. One such dark trail is the "What if?" trail. Have you been down the "what if?" trail? It's the one that starts with a worrisome thought. That thought leads to another and before you know it, you are up all night thinking through all the potential catastrophe's that could happen. Here's a "what if?" 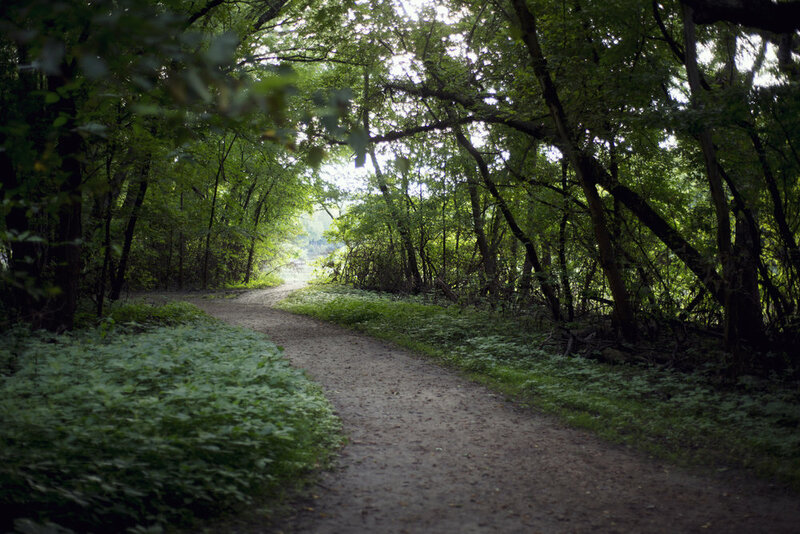 trail I often traveled when my kids were younger: First, I heard my child cough in the other room. I immediately thought, "What if that's a cold?" Then I continued down the trail. "What if it becomes a bad cold? What if it triggers his asthma? What if we can't get the asthma under control? What if it's not a cold but an infection? This will be the sixth infection in eight months. What if the doctor decides he needs surgery? What if...?" And on it went until my stomach was twisted in knots. While this scenario was about a child being sick, in truth, anything we fear can drag us down the "what if?" trail. The loss of a job. Conflict in a relationship. A failure of some kind. The unknown future. Our minds zero in on those things and consider all the possible outcomes. We expect and anticipate the worst. We plot and plan ways to take control of what we fear might happen. Before we know it, the "what if?" trail has led us farther and farther away from joy and peace. For those of us who often travel this trail, we hate its pull on us. We long to face the challenges and fears of life with confidence and hope. We desire to walk in the light of peace, rather than the darkness of fear. We want our "what if's?" to become "even if." From "What if? to "Even If"
That's what I love about the Psalms. The writers of these Hebrew poems knew the worries and fears of life. They felt deep and profound fear and voiced those fears to God. They described their emotions in vivid words and metaphors. But they didn't end there. In the midst of their fears, the writers focused on who God is and what he has done. They reminded themselves that God alone was their hope and salvation. The truth is, worries and fears will be always be with us. We live in a fallen world where bad things happen. There are legitimate things to fear. But we are not without hope in the midst of those fears. We have an anchor to cling to. Our fears do not have the final say. Though we wander down the "what if?" trail, the light of God's truth leads us back. In Psalm 27, David had enemies who wished him harm, "false witnesses have risen against me, and they breathe out violence" (v.12). For those who have read of David's life, we know that many enemies pursued him and wanted him dead—King Saul being one. David was on the run many times from those who hated him. He certainly knew fear. Yet this psalm is one of confidence in the God who is light and salvation. David wrote, "The LORD is my light and my salvation; whom shall I fear? The LORD is the stronghold of my life; of whom shall I be afraid?" (v.1). In this psalm, David turned to God for help and hope. He cried out, "Hear, O LORD, when I cry aloud; be gracious to me and answer me! You have said, 'Seek my face.' My heart says to you, 'Your face, LORD, do I seek.' Hide not your face from me." (v. 7-9). David had confidence in who God is. He knew God was his deliverer and the source of his salvation. He rested in God's goodness. Rather than "what if?" David asserted, "even if." "Though an army encamp against me, my heart shall not fear; though war arise against me, yet I will be confident" (v.3). He was confident in who God was for him, so much so, he could say, "even if." Even if his enemies gathered all around him, he would trust in the Lord. This is true for our hearts as well. A Christian's confidence is grounded in who God is and not in who we are. Our confidence in the midst of fear isn't about our own strength or our own wisdom. It's not about what we can do, but about what God has done. Out of his rich love and grace, God sent his Son to face our greatest fear—eternal separation from God. Jesus Christ bore our sins on the cross, redeemed us from our captivity, and brought us back into right relationship with God. As the Apostle Paul reminds us, if God can save you from your sins, how can he not help you with whatever is going on in your life right now? (see Romans 8:32). This grace is so amazing and so wondrous that it overwhelms fear. We can't help but respond in worship—even in the face of fearful circumstances. That's what David did: "And now my head shall be lifted up above my enemies all around me, and I will offer in his tent sacrifices with shouts of joy; I will sing and make melody to the LORD" (v. 6). The fearful circumstances in David's life didn't go away, but he knew God was for him and so he rejoiced. David had a holy fear of the Lord. He loved God. He enjoyed fellowship with him. His greatest treasure was being known by God. He sought shelter and safety in his presence. "One thing have I asked of the LORD, that will I seek after: that I may dwell in the house of the LORD all the days of my life, to gaze upon the beauty of the LORD and to inquire in his temple. For he will hide me in his shelter in the day of trouble; he will conceal me under the cover of his tent; he will lift me high upon a rock" (vv. 4-5). Because David was on the run, he could not go to the temple, the place of worship for God's people and the place of God's presence. On this side of the cross, because of Jesus, we have full and unhindered access to God. His presence is no longer in a temple on Mount Moriah, but within God's people. At all times and in all places, our God is with us. Isn't that amazing? The God of the universe, the One who flung the stars across the heavens, lives in our hearts. He will never leave us or forsake us. This truth gives us great courage in the face of our worries and fears. Psalm 27 ends with David's encouragement, "Wait for the LORD; be strong, and let your heart take courage; wait for the LORD!" (v. 14) Generations waited the promised Messiah and their longing was fulfilled in Christ. Dear friends, let us wait on the Lord's deliverance from all our fears with courage. He is faithful; he will deliver us. He alone is our help and hope. He has proven himself over and over. We can trust him, so much so, that in Christ our "what if's?" become "even if."